Every morning for the last few weeks I have looked in the mirror and thought to myself, ‘Is this actually happening?’ Every week, something occurs that makes it all a little bit more real. Paperwork to sign, the surreal joy of ‘tree shopping’, writing biographies about myself and then today, the exciting news shared with the rest of the gardening world. 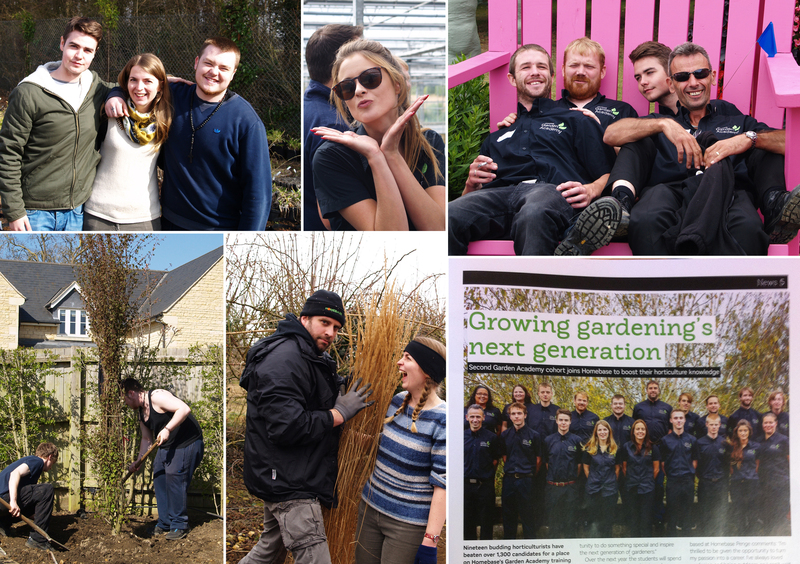 For a long time I have wanted to build a show garden and this year I am lucky enough to be a Young Designer of the Year finalist at RHS Tatton Park Flower Show. It’s going to be one hell of a journey and as people keep on kindly pointing out, the next few months are going to fly by. I could easily lock myself away from now until July, mumbling about plant heights, measurements and the number of grey hairs that may appear on my head. However, I want to share the experience, so that on Tuesday 17th July when I am stood on my completed garden, I can remember just how much has been achieved. Hopefully I can give a little behind-the-scenes snapshot of the process, from finding plants, to scratching my head over construction methods. I’m also making several handmade features for the garden too. There is every possibility they might not work, but I’ve got everything crossed that they will. I’ll write more about my garden in the coming weeks, but you can also read about it on the RHS website. Watch this space, I’m going to be back blogging very soon and with some exciting news too…. When the rigid days of summer begin to slouch, someone flicks a switch and the bounty of autumn is everywhere. The countryside becomes a squally mess of exhausted hedgerows, their aching limbs laden with fruit. Bunches of berries cover the hawthorn’s branches, lasting into the colder months long after the leaves have fallen. Others don’t keep; the smell of rotting apples lingers, and deceptive blackberries still appear ripe until the fruit is touched and turns to a sodden pulp. Strings of rose hips hang like plump fairy lights. Draped over branches for support, the hips glow red and orange. They are filled with many small seeds, each one covered with a head of fine hairs – so minute they make a fantastic itching powder. Guarding the tempting fruits is a tangle of stems with tooth-like thorns. These are where the dog rose gets its name. Their bite could certainly rival any terrier’s canine. Other stories say it was a good medicine to treat rabid dog bites, or that it was originally named ‘dag’ rose after the dagger-like thorns. From late May to July, long before the pitter-patter of falling leaves, the thorns are blunted by a mass of blushing flowers. Each lightly scented bloom is neatly arranged of five confetti pink, heart-shaped petals. Harvested and used to make syrup or rose water, their floral flavour evokes an Eastern feast of exotic spices and sticky puddings. Both are simple to make; gathering the quantity of petals needed is the only difficulty. The fat hips are also good in the kitchen and contain 20 times as much vitamin C as oranges. During World War Two when citrus fruits could not be imported, the government encouraged people to gather hips as an alternative. They make a fantastic sweet preserve, perfect for spreading on a Sunday afternoon crumpet, while a syrup of the fruits has long been used to treat the common cold. A fine excuse for a spoonful of bright red, warming and sickly ‘medicine’. Another theory for its name is ‘dog’ meaning worthless, presumably in comparison to cultivated roses. It is the rebellious sibling in the family, but shouldn’t be dismissed from the garden entirely. Its tough, vigorous nature (and thorny barrier) makes it ideal as a hedging plant, robust-enough for coastal locations, and tolerant of poor soil. The sprawling silver stems make this briar more suited to informal gardens. 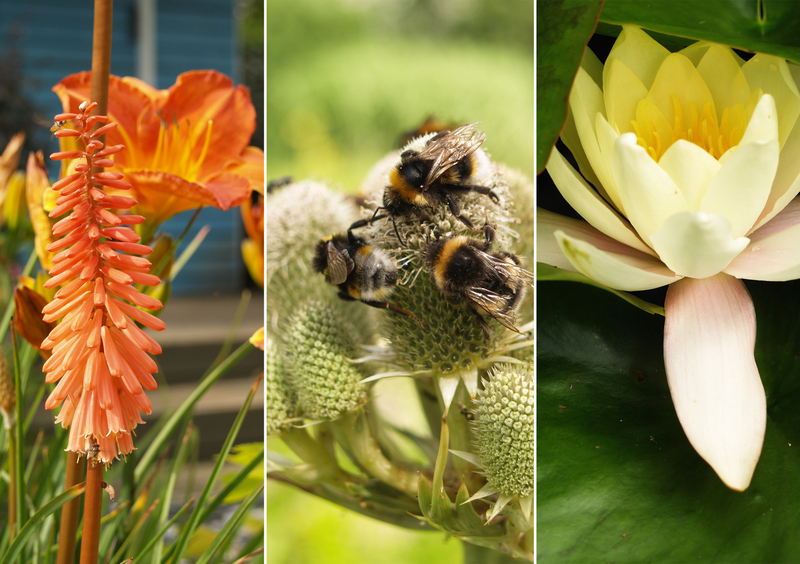 It has a natural familiarity and is perfect for wildlife-friendly gardens, as well as blurring the boundaries between our tended borders and nature beyond. At The Courts Garden near Bradford on Avon it is used with an unusual twist, or perhaps a happy accident. Planted in long rectangular borders, the nodding branches of thorns and berries skulk between billowing Nepeta and mounds of Stipa tenuissima. Growing to more than 3m (10ft) the dog rose does need space to stretch. In rural locations along tunnels of wiry undergrowth, it is clear this native briar thrives rooting around a maze of rabbit warrens and badger runs. Relying on the support of its neighbours, yet fighting for the biggest autumn crop is the endurance the dog rose revels in from one season to the next. After such a long hiatus (take a look at my Published work to see what I’ve been up to), I couldn’t help but write about a long awaited trip to a very special garden. Stood with in earshot of the A120, and less than 15 minutes from the centre of Colchester, it is difficult to imagine that a garden could so easily transport you away from the present moment. And yet among the island beds of Beth Chatto’s Gravel Garden, I could have been stood in the mountainous foothills where she found inspiration. 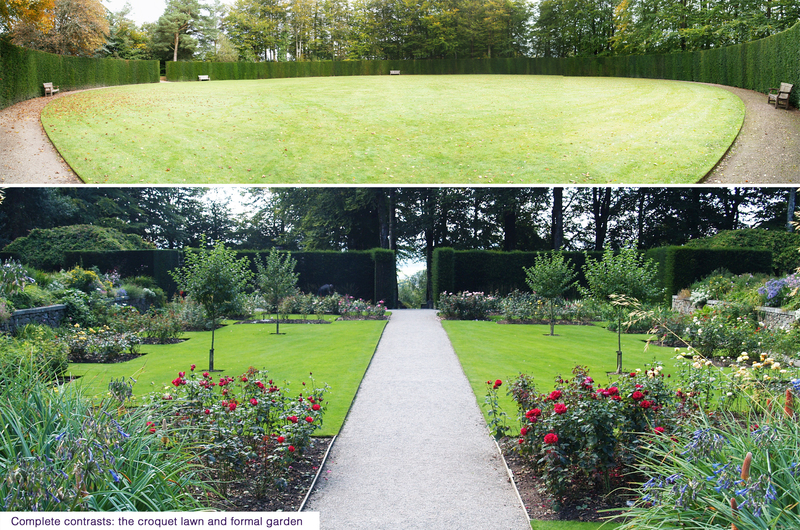 The Gravel Garden was started in 1991, converting 0.35ha (¾ acre) of parched grass car park into a new garden. Faced with low average annual rainfall and poor quality, heavily compacted soil there was uncertainty about whether anything would ever grow. However, instead of despairing at the conditions Beth used these to her advantage. This included taking into consideration the changing weather patterns, with hotter, dryer summers and milder winters. By early spring 1992 the first plants started to fill dry riverbed-inspired design. Beth used hosepipes to define the beds, creating two long outer borders with a series of sinuous island beds between. The pathways looped their way around the garden with no formal direction or shape. In a dry, gravel-covered garden, especially on a hot summer’s day, the atmosphere could have felt arid. However, the Gravel Garden is anything but. 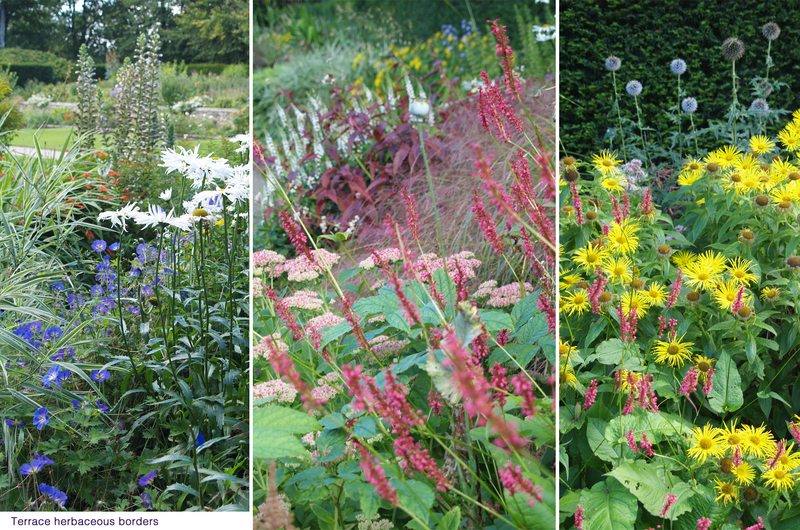 The planting is abundant and vivid, combining herbaceous stalwarts with unusual neighbours. Swathes of purple and silver, including Allium sphaerocephalon, Eryngium giganteum and Verbena bonariensis mix with airy grasses, such as Stipa tenuissima and S. gigantea. The planting is a magnet for wildlife too, with pollinators hopping between blooms and birds taking cover in the plants. Many of us are driven by colour when we garden, but in the Gravel Garden dramatic combinations of texture and shape are the main focus – even in the height of summer. At the edge of one bed the almost succulent leaves of Bergenia, with their stout, upright stems of flowers are set against a background of the fine billowing New Zealand blue grass, Poa labillardierei. Elsewhere, Verbascum bombyciferum seeds freely around the garden. As a biennial, the silvery leaves create architectural rosettes, before throwing up triffid-like spires of yellow flowers that tower over the borders. The rosettes, which almost look like a Sempervivum on steroids, are such a contrast to the surrounding plants, including the strap leaves and arching blue heads of Agapanthus, and delicate, scented Origanium. Somehow everything is harmonious, yet the considered planting design means that every border is punctuated by a glut of shape and texture. With such a varied and rich use of plants, the gravel plays an important role in keeping the whole area securely linked together. Although the borders and pathways have clear definition, the sea of gravel that creeps between the spreading plants softens any hint of a line. In many ways the Gravel Garden doesn’t feel like a garden at all. It is an ongoing plant study, living art installation, nod towards our changing climate and sickening proof that so many of us could spend less time watering. If the ‘right plant, right place’ adage needed a mascot the Gravel Garden would surely be it. Flaunting the rules of planting may seem like fun, but if following them can create a garden as beautiful as Beth’s then I’m happy to oblige. Visit The Beth Chatto Gardens website for more information. It often feels like the period between New Year and the end of January is a gardening void. Pre-Christmas, winter-interest shrubs and frosty scenes on greetings cards are prominent. Then once Christmas and New Year have gone, and we are well and truly fed-up with tinsel and turkey, there is a lull. At this point I am desperate to get excited about the approaching seasons, but they still feel far away. However, a sunny cold day is the perfect chance to get outside and explore other gardens. I love to see the uncluttered bones of a design and although I miss busy summer borders, the bare stems of winter can be just as attractive. The purpose-designed Winter Garden at Anglesey Abbey, just north of Cambridge, is no exception. In 1996 the modest garden was created in the 114 acres of parkland, and 20 years later it is at its peak. Looking at the estate map the garden looks small and narrow, especially in comparison to the rest of the vast estate. However, the Winter Garden is anything but. Measuring 20m wide by 350m long, the design is simple but maximum impact. Two long borders run the length of the walk, divided by a gently curving serpentine path – with just enough bend to obscure the view around the next corner. Trees have also been planted on the curve of the path, breaking the perspective and adding height. 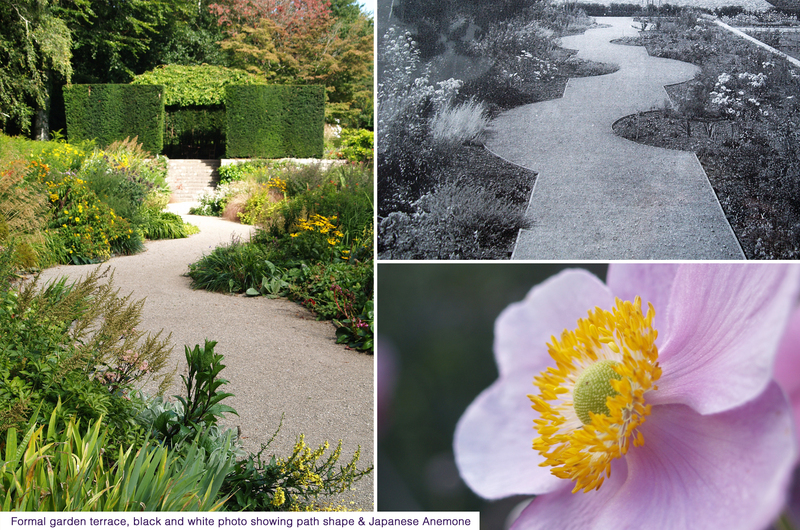 Clever planting helps to make walking down the single path an enticing journey. The planting is bold, with confident blocks used to heighten the impact of winter colours, textures and scents. Cornus sanguinea ‘Winter Beauty’ is planted en-masse, the fiery stems licking the edges of the path. Nearby a sea of Sarcococca is in bud, ready to fill the air with a beautiful sweet scent, while pollarded Salix erupt through the evergreen foliage. Varigated Euonymus fortunei ‘Emerald Gaiety’ is used liberally and pruned to keep the shrub as a frothy lower layer. Under planted around winter flowering Viburnum x bodnantense ‘Dawn’ and contrasting against the toasted bark of Acer griseum. The chalky, distressed stems of Rubus have space to roam down the borders. Below the thorny arms is an array of emerging spring bulbs. Early snowdrops are upright and blooming, while daffodils are still developing; even some unseasonally early Iris’ are braving the cold. Other flowering winter gems include many forms of hellebore and the yellow ribbon-like flowers of Hamamelis x intermedia ‘Barmstedt Gold’. The planting scheme in the Winter Garden may be big and bold, but the combinations could easily be scaled down to suit a smaller garden or border. Even at the end of the meandering path the spectacular ghostly grove of Betula utilis var. jacquemontii could be recreated with just one specimen tree taking the focus. Thank goodness winter gardens aren’t just for Christmas. Austere as the granite fortress may seem, perched on the edge of a gorge-like valley overlooking rugged countryside and bleak moorland beyond, it was never intended to defend or do battle. The highest garden owned by the National Trust, 862 feet above sea level and only completed in 1930, Castle Drogo is a modern masterpiece, and the last castle to be built in England. I have grown up with Castle Drogo right on my doorstep. As a little girl I carried armfuls of flowers through the wood-clad corridors and watched the local flower club, which my mum belonged to, bring the house alive. Formal fireplaces were set ablaze with bold stems of scented lilies, while the kitchens were a cottage garden delight of produce and annuals. In my teens I performed in a play that told the story the Drewe family who once lived in the castle. The gardens were our stage and the moving performance wound its way down to the imposing granite entrance of the cosy castle. The Drewe family bought the empty plot of land and gave gifted architect, Edwin Lutyens, a budget of £50,000 to build the house and £10,000 for the gardens – although the project had cost three times the original estimate by the time it was finished. Lutyens embraced the unusual brief of a Norman fantasy fortress, but made sure that the castle had all the mod cons it would need to be a snug family home. 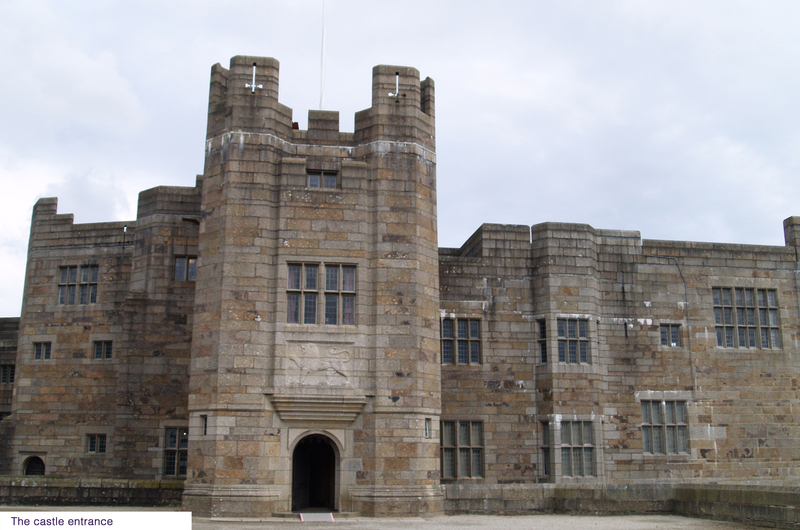 The design included a flat asphalt roof, which began to leak soon after the castle was completed and continued seeping water into the house until a major scaffolding-clad restoration project began in 2012. Completely detached and hidden from the family home, the gardens are approached by a set of moody granite steps; flanked on either side by towering yew hedges, which are guarded by a windbreak of beech trees. With out this wall of greenery the borders would be battered by unforgiving moorland winds – the location receives an average rainfall of 45 inches every year. Anyone making their way down the long, sweeping drive would travel straight past the gardens completely oblivious. There are no entrance lodges, ornate sculptures or flawless topiary, just unruly heathland and beech trees. Lutyens put as much effort into the gardens as the castle and with the help of knowledgeable plantsman George Dillistone, the area was divided into three separate spaces. The first room, discreetly hidden by the yew fortress, is a formal garden. A checkerboard of rose beds divides the pristine lawn, with four newly planted crab apples adding height to the lowest part of the garden. 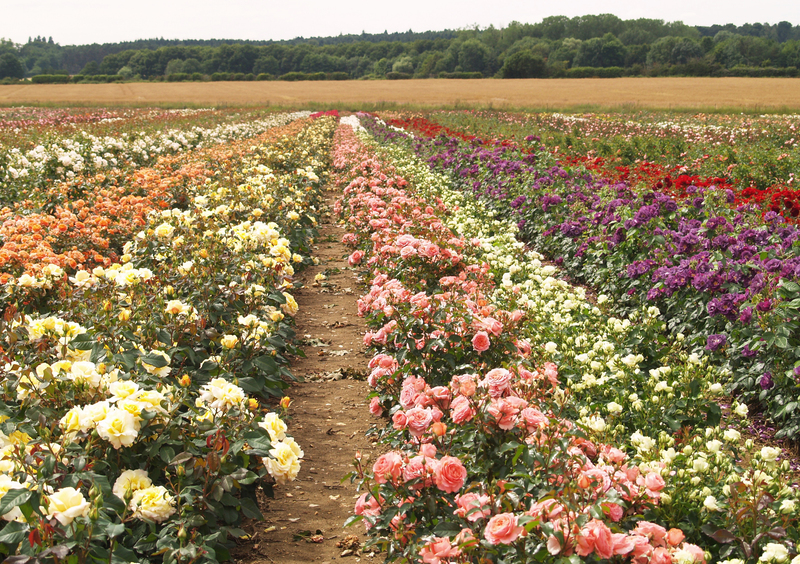 Making sure the roses are healthy is a labor-intensive job as the soil condition is poor acidic and stony. Each corner of the formal garden is punctuated with breathtaking domes of pleached Persian Ironwood (Parrotia persica ‘Pendula’) – welcome areas of cool air and shade on hot, still days and simply planted with hart’s tongue ferns (Asplenium scolopendrium) and European wild ginger (Asarum europaeum). 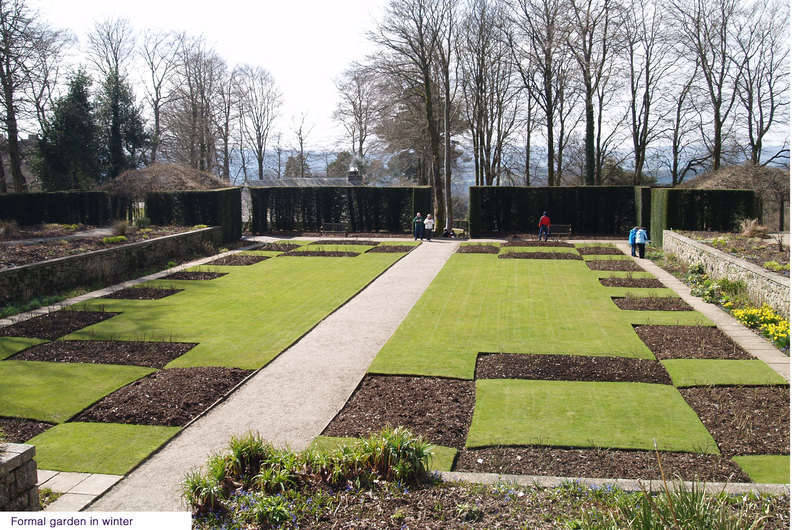 On either side of the lawn are raised terraces with deep herbaceous borders. A path runs from one end of each terrace to the other, although instead of being a continuous line, elliptical curves allow planting to spill over the path and create a meandering walk. It is believed that the design work Lutyens did in Delhi influenced the shape of these paths. More glittering granite steps, with twisted wisteria mirrored on either side, lead to the next level of terrace – a small fragrant garden. Again, balance is key. The long strip of terrace has two of the four Persian ironwood domes at either end. Yew forms the skeleton of this area also; two benches look back down towards the formal garden, positioned in alcoves cut from the hedge. 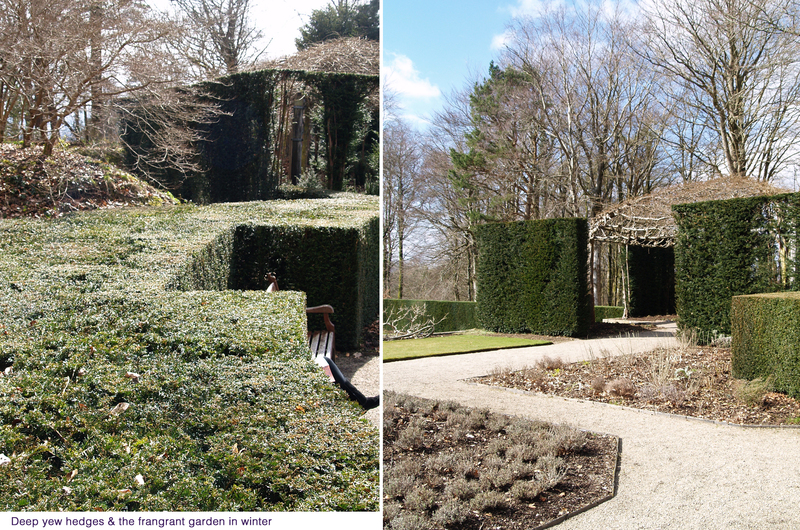 It is clear how important shape and symmetry are in the formal garden below. Even though there are multiple levels, the strength of shape and sharp line makes it all interlock seamlessly. The formality suddenly changes, after climbing another flight of steps, as crisp lines of the pathway disappear, blurred by the branches of Japanese maples, magnolias and azaleas. Winding woodland paths loop around the back of the shrubs where ferns and foxgloves grow side-by-side under the towering beech trees. The formal garden is a distant memory, with the boundaries of the surrounding Dartmoor National Park trying to creep into the garden. 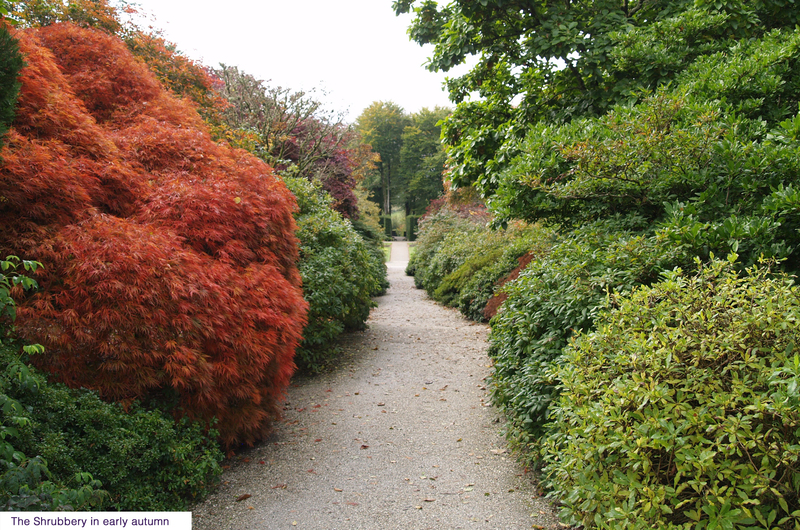 The Shrubbery is a complete contrast to the perennial-heavy formal garden; it provides a fiery display in spring and autumn when the rest of the garden taking a breather. One last room awaits and it is possibly the boldest space in the entire castle. A final ascent of steps leads to the huge, but empty, circular croquet lawn. The simplest but most striking part of the garden, a pathway circles around the island of grass, with a loop of familiar yew hedge and beyond that the halo of beech, appearing taller than ever. The framing provided by the trees makes the sky as important as the plants themselves. The branches seem to reach up and touch the clouds, pulling the atmosphere down into the garden. For an enclosed space, the structure and size of the trees and hedging, coupled with the vastness of sky, stops the garden feeling small and understated. The simplicity of the croquet lawn never ceases to excite me whenever I visit. 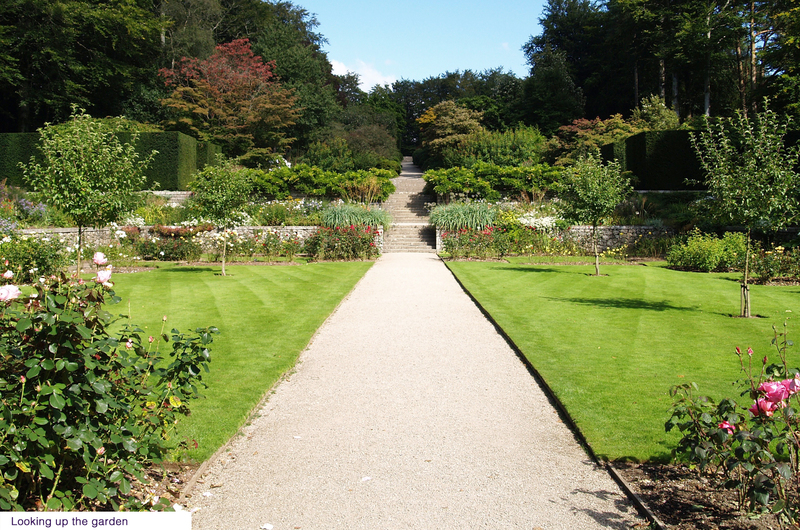 The gardens at Castle Drogo are not large, especially compared to many stately homes. However, this helps them to feel more like a family space, not a statement of wealth or something boasted about whilst taking tea in the drawing room. It owes its success to three elements: beech, yew and granite– the backbone of the design, and the defense system guarding the precious microclimate. Combined with beautiful planting and enforced by inspirational line and shape, Castle Drogo is a garden that will always feel like a second home – forever welcoming me back with open arms.